"Learn not only to be professional but to have a mental makeup to be able to pursue anything with unflinching devotion and selfless passion"
Professor Dr. Shibabrata Chatterji, the Founder Director of Indian Institute of Psychometry was born on 5th February 1931 and passed away on 26th June 2006 in Kolkata after a few days of illness. 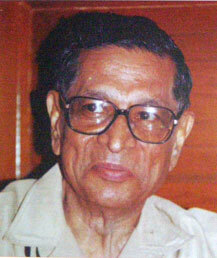 He was the Head of Psychometric Research and Service Unit (PRSU) of Indian Statistical Institute (Kolkata) from 1959 to 1991. He started his academic career in 1953 as a Research Assistant at Patna University and joined ISI as a Research Scholar in 1955 and ultimately became the Head of PRSU in 1959. Indian Institute of Psychometry – IIP is an Institute which is involved in harnessing, nurturing and cultivating Human Resource for today’s as well as tomorrow’s India. We at IIP are taught to believe in ourselves and to believe in you (if you do believe in yourself !). Because "nothing is impossible for him who believes". The cornerstones of the structure of the Institution are the Directors of IIP, Prof. S. Chatterji, and Prof. (Mrs.) Manjula Mukerjee (Chatterji), who by capitalizing their beliefs and investing their reputation and goodwill (earned during their tenure at the Indian Statistical Institute) launched IIP with a very modest beginning on 18th July 1978. Indian Institute of Psychometry - IIP is an institute which is involved in harnessing, nurturing and cultivating Human Resource for todauy's as well as tomorrow's India. We at IIP are taught to believe in ourselves and to believe in you (if you do believe in yourself). Because "nothing is impossible for him who belives". "An organisation in which public is interested" the company's Act (1956) offered this status, to the Institute which is a registered body under Section 25 of the Act. All the members in the Board of Directors of the Institute are associated with it in purely honarary capacity. The Institute is run by a Governing Body consisting of five members. Currently its day to day activities are executed by two of its permanent members as authorized by the members of the Governing body.